Welcome to the beautiful new world of Windenburg, with picturesque landmarks to explore like the sprawling hedge maze at the garden chateau, alluring pools along the bluffs, and the mysterious ancient ruins. Visit local hotspots and grab a delicious espresso at the cafe, chat up your favorite crush at the pub, or dance the night away at the discotheque. Get together with other Sims for exciting group activities like thrilling games of foosball, lively midnight bonfires, super-secret dance parties, and more! You can also join different clubs with distinct personalities and style, to meet new Sims and live it up. 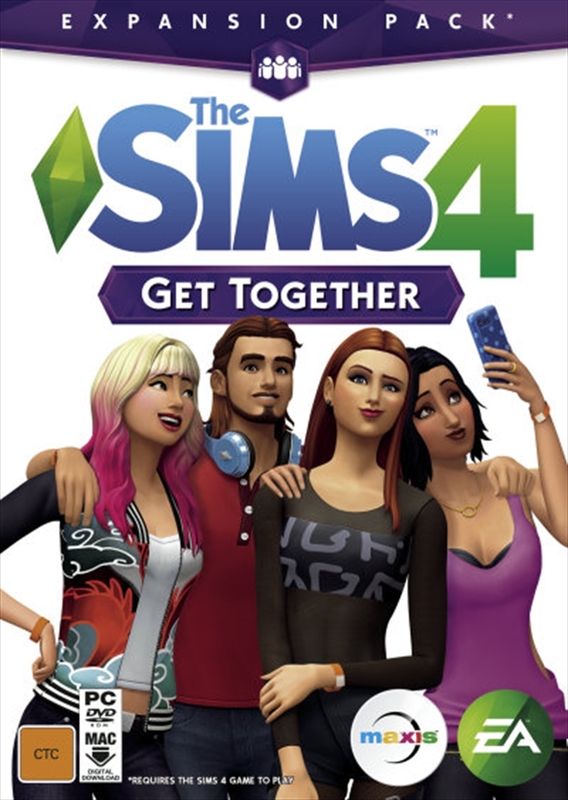 In The Sims 4 Get Together there's always a great reason to get together. modern business district, and exclusive private island. afternoon Sim watching at the outdoor cafe, meet up for drinks at the local pub, dance the night away at the underground discotheque, get lost in the sprawling hedge maze at the garden chateau, take a dip in the alluring pools alongside the bluffs, or explore the mysterious ancient ruins. Party Anywhere: Throw parties anytime, anywhere! Head out to the ruins or any of your favorite party spots, and set up the DJ booth to get the party started, build a bonfire to heat things up, dare other Sims to get into some hilarious situations, and sneak away for a quick romantic romp in the bushes with the Sim next door.